The Global Volcanism Program has no activity reports for Lolo. The Global Volcanism Program has no Weekly Reports available for Lolo. The Global Volcanism Program has no Bulletin Reports available for Lolo. Lolo is a small, nearly symmetrical 796-m-high andesitic stratovolcano located north of Witori volcano along the north coast of New Britain near Cape Hoskins. It is of very late Pleistocene or Holocene age and overlaps the older Kapberg volcano to the west (Blake and McDougall, 1973). Lava flows are prominent on its flanks, and a well-preserved crater 250-m wide and 60-m deep truncates the summit of the stratovolcano. Blake D H, McDougall I, 1973. Ages of the Cape Hoskins volcanoes, New Britain, Papua New Guinea. J Geol Soc Aust, 20: 199-204. The Global Volcanism Program is not aware of any Holocene eruptions from Lolo. If this volcano has had large eruptions (VEI >= 4) prior to 10,000 years ago, information might be found on the Lolo page in the LaMEVE (Large Magnitude Explosive Volcanic Eruptions) database, a part of the Volcano Global Risk Identification and Analysis Project (VOGRIPA). There is no Deformation History data available for Lolo. There is no Emissions History data available for Lolo. Conical Lolo volcano rises to the north beyond steaming lava flows from the 2002 eruption of Pago volcano. Lolo is a small, nearly symmetrical volcano located north of Pago volcano along the north coast of New Britain near Cape Hoskins. It is of very late Pleistocene or Holocene age and on its western side overlaps the older Kapberg volcano, the topographic irregularity left of Lola. 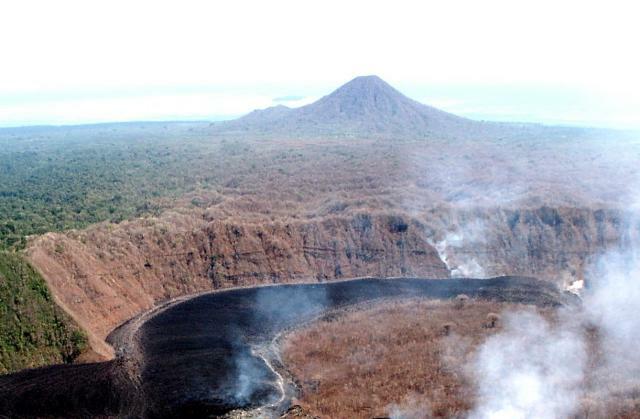 Lola is capped by a well-preserved crater 250 m wide and 60 m deep. There are no samples for Lolo in the Smithsonian's NMNH Department of Mineral Sciences Rock and Ore collection. Large Eruptions of Lolo Information about large Quaternary eruptions (VEI >= 4) is cataloged in the Large Magnitude Explosive Volcanic Eruptions (LaMEVE) database of the Volcano Global Risk Identification and Analysis Project (VOGRIPA).